Nelson Mandela who was imprisoned for 27 years for leading the anti-apartheid movement in South Africa, later becoming the country’s president after liberation, died today. For his lifelong service to freedom and humanity, Mandela attained the stature of the moral leader of our planet, an honor no other human being has ever attained in history. Uskowi on Iran extends its deepest condolences on Madiba’s passing to his family, the people of South Africa and to all freedom-loving citizens of the world. May his legacy persist and expand. Infinite respects for eternity. Mandela is dead, long live Mandela !!!!! Nelson Mandela had stated in the past, that the US is the biggest DANGER for the world peace !!! P.S. Where is Mat, has he been hijacked by the Zionists ?? Maybe "-A" knows his whereabouts ? It may offend our American sensibilities but after being released from prison the first foreign dignitary visited by Medela to give thanks was Fidel Castro in Cuba, he said for sending the Cuban expeditionary force to Africa against apartheid South Africa, in so doing liberating souhern Africa. He also thanked the Islamic Republic of Iran for their stance against colonialism, particularly at a time when President Reagan pushed back against efforts at unseating the apartheid regime, which at the time had also offended our American sensibilities. THE Beacon of democracy that never was and never is!! South Africa stands today as the most striking example of double speak and hypocrisy and utter diabolic nature of the US foreign policy!.As the US today stand between the citizens in Syria and fair polls by supporting a group that has shown to whole world that it can not be trusted with power.YET it is not the first time that the US has made a real assault on democracy. After His release from prison the South African Icon wished to make a global tour and He chose Libya and CUBA.This was rejected by the US advising Him to shun away from these leaders!.But unknown to the world three countries stood firm with the South Africans in their struggle with the colonialists and these are IRAN ,CUBA,and Libya. Mandela rejected the advise of the US by disclosing that in fact the US was one of the leading countries in the world to violate the sanctions by trading ,cutting deals behind the curtains ,with the apartheid South Africa and yet it has the guts to 'choose friends for us'.It is believed by many people that ISRAEL fattened its economy during those dark days of sanctions by trading freely and mining Uranium unchecked and in fact went ahead to build A nuclear reactor FOR the regime. @-Why did the US side with the apartheid regime in south Africa instead of siding with the majority and demand a fair poll- SO why does this empire throw away the principles of democracy and opts to stay in the dark and cut deals WITH dictatorial regimes at the expense of democracy! @-Saudi Arabia is another case of double speak from the 'beacon of democracy' kissing and hugging the royal family yet Saudi Arabia stands as one of the most cruel violators of human rights.-so why does this empire stay in the dark cut deals with cruel regimes and inhuman violators of human rights at the expense of democracy?. Do I have to take your irony as the ludicrous assertion that I could be some sort of a highly masochist Zionist sympathizer ? It's been two times already you've seemingly closed in on such theory, if i'm not mistaken. Would you really dare make such a gigantic joke of yourself considering my countless lengthy past post I made condemning/insulting/belittling everything Zionist on that blog alone, on every single opportunity, tirelessly slamming any Zionist fanboy and his so-called "arguments" in the process ? Do I not despise them enough to you ? As we say in farsi, "Zionist ha sayamo ba tir mizanan". And I'm pretty much ok with that. So what is wrong there ? Are you upset because I put Islamic opportunistic, warmongering, Hamas-supporting hard-line fundamentalists in Iran on an equal footing ? And maybe I got it wrong altogether in which case I'd owe you an apology. But sadly, I doubt it. I know it is not right that I should use this occasion to talk about the Iranian politics but I cannot help but to wonder how different our country would have been if we had a leader like Mandela. What would have happened if the leaders of the Iranian revolution had chosen a path similar to Mandela? It is a good time for our leaders to reflect and question what were the qualities that made a man from a small country on the tip of the African continent to become one of the most respected and revered leaders of the 20th century? 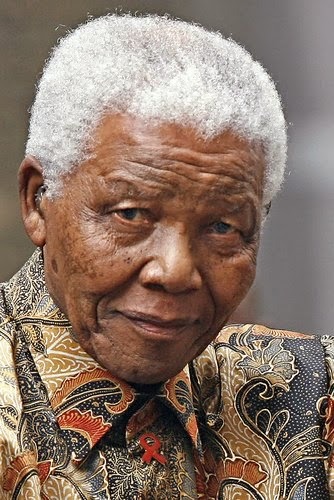 It is quite remarkable that after 27 years of incarceration in apartheid prisons he never sought revenge against those who put him in prison, but instead focused on building a better country for all of its citizens – black and white, moselm and christian, hidu and Jew, believer and nonbeliever, and even gay and straight . I believe, that by examples of the hipocrysy and enormous double standards, the US has usurped the rights to pretend, that it is "the BEACON" of enlighment for the humankind.... and its South Africa's policies are ones of the countless double standards. The Islamic Republic has already passed times, where the military threats against it, could somehow materialize. Next year, the windows of opportunity for its enemies will definetely close ........forever. Because of Islam...it's the root cause for our nations demise. I agree a barbaric religion that is rooted in a barbaric culture that has no tolerance for anything. If this religion teaches that anyone else except themselves are kafer then what do you expect. A nation build on foundation of Islam will never progress. There is no such thing as tolerance in Islam. More hasbara shilling from someone who clearly does not know what apartheid means. "a barbaric religion that is rooted in a barbaric culture that has no tolerance for anything. If this religion teaches that anyone else except themselves are kafer". A perfect description of zionism, which replaces the word kafer with the word goyim.